All the honeybees we see foraging for nectar and pollen are female and unless we keep hives we'll probably never see a male bee. The worker honeybees' jobs include: caring for larvae (baby bees), making wax, building honeycomb, cleaning up the hive, storing pollen, cooling the hive, making honey, guarding the hive and collecting pollen and nectar. They are busy little creatures and I feel fortunate that they stayed still long enough for me to snap a few photos! I appreciate that they pollinate flowers as they forage for pollen and nectar. I also have a fine appreciation for their honey making abilities! 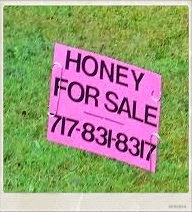 Which brings me around to yesterday morning when I noticed this pink sign in a neighboring yard. I stopped by last night to meet Jodi the beekeeper and her bees. What a delightful surprise! She and her husband Matt are native plant gardeners! They're removing invasives! They've built a rain garden to solve their water drainage problems! They have hives! Hillwood is lucky to have them! I am lucky that they live around the corner from me. Of course, you all know that my beloved Bumbles and other native bees are first and foremost in my heart, but, a gardener has to get honey and what could be better than honey made by bees that might have visited my garden! It's your garden, plant what ever you want and please, remember to never, ever, ever, ever, use pesticides. I mean never! How cool to be able to get honey from bees who probably did visit your flowers! Nice photos, too! It's always fun to see the fuzziness on them. I have no doubt those bees have enjoyed your bountiful beautiful buffet many times! How cool to have a kindred spirit nearby! Girl power! Too cute. =) Is there anything more relaxing than watching bees? Honey Bees are the sweetest! They are all about Girl Power! Love it!! Yum! Great shots of the bees. I love that they're so close the honey might have been made from your own flowers. We buy honey from a beekeeper in our area - so good! Great photos of your bees. I didn't see too many honey bees in our garden this year. Plenty of bumbles tho. I hope you have a great weekend too. Great post and Links! I was on the Bridge of Flowers yesterday and the flowers were just full of bees. Mostly bumblebees I think. You can see why they were there on the Bridge's Facebook page https://www.facebook.com/pages/Bridge-of-Flowers/130369333692022 I didn't get photos of them, or of all the bees in my garden. They make me so happy. how wonderful to actually meet a neighbour who shares the gardening for biodiversity mindset. Instead of - you what? Eww bugs!! Sweet (literally and figuratively)! And you made some new friends who share your love of native plant gardening. Perfect! What a wonderful find and kindred spirits...love the pics too!! Gorgeous photos! I find that honeybees are the hardest of all to photograph--they're just too busy to stay still. How neat to have honey from bees that may have visited your garden! It reminds of the times a local beekeeper used to bring his hives to my Dad's farm so they could enjoy the clover for awhile. He always gave Dad some honey to share, and it certainly was delicious! I didn't realize they had fuzzy bodies too! Thanks for the great close-ups. Just finished a gigantic croissant from a local bakery - that honey would have been perfect. Thank goodness, I don't have to fit back into a hive. 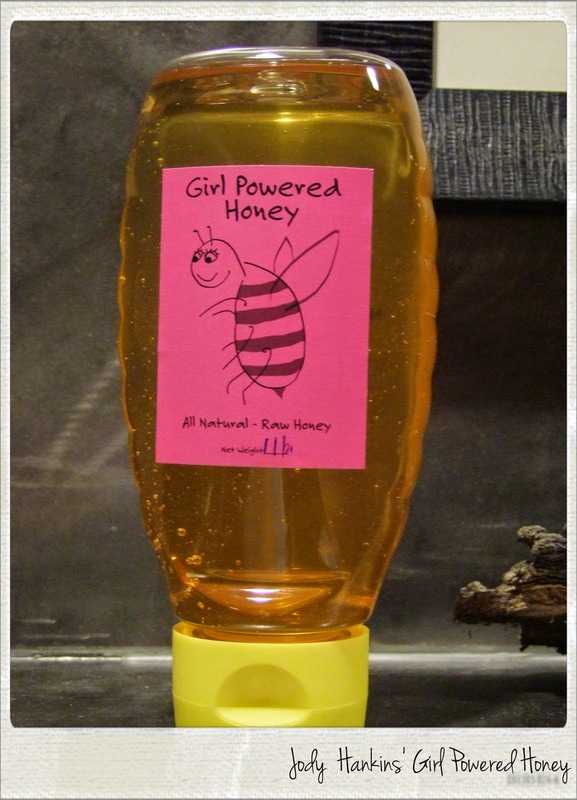 Oh that's awesome to have honey made by bees that potentially foraged in your garden! Several people have told me I should keep bees (probably since I garden with them in mind), but I think that would be out of my skill range. I love seeing them happily foraging on all the plants though!